Working in sales and marketing, there's little margin for missed follow-ups. Zoho CRM's workflow automation makes your business hours more productive by finishing routine tasks for you. 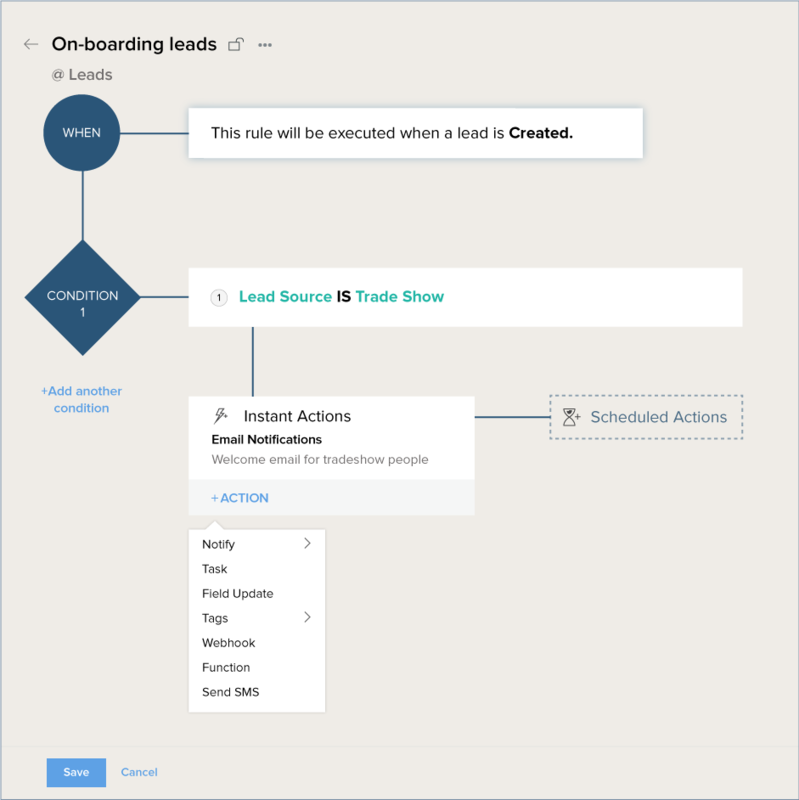 From sending emails to customers to following up with leads to updating required fields, there's a lot you need to do everyday. Workflow rules help you get that work out of the way by automatically triggering those actions when specified conditions are met. Set up to 10 conditions for a single rule, and increase the power of a single workflow 10 times. Zoho CRM follows up your way. Performing the right actions at key stages of your sales process is crucial. 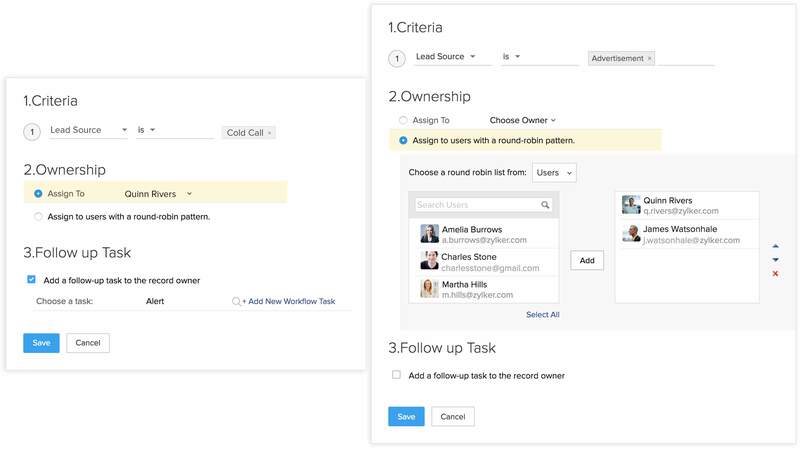 Zoho CRM comes with pre-defined actions like sending emails, scheduling tasks, and updating fields that let you automate different sales routines, either instantly, or at a later date. You can also define your own custom actions through the Zoho Developer space to meet your specific business requirements, like sending personalized SMS notifications to your customers when their orders have been confirmed, dispatched or delivered. Know how your workflows perform. Workflow rules help you complete your routine tasks faster, but do you know how each of them performs? Workflow insights analyze and break down each rule for you. From knowing the number of records that go through a particular rule to knowing how many leads have opened your email. 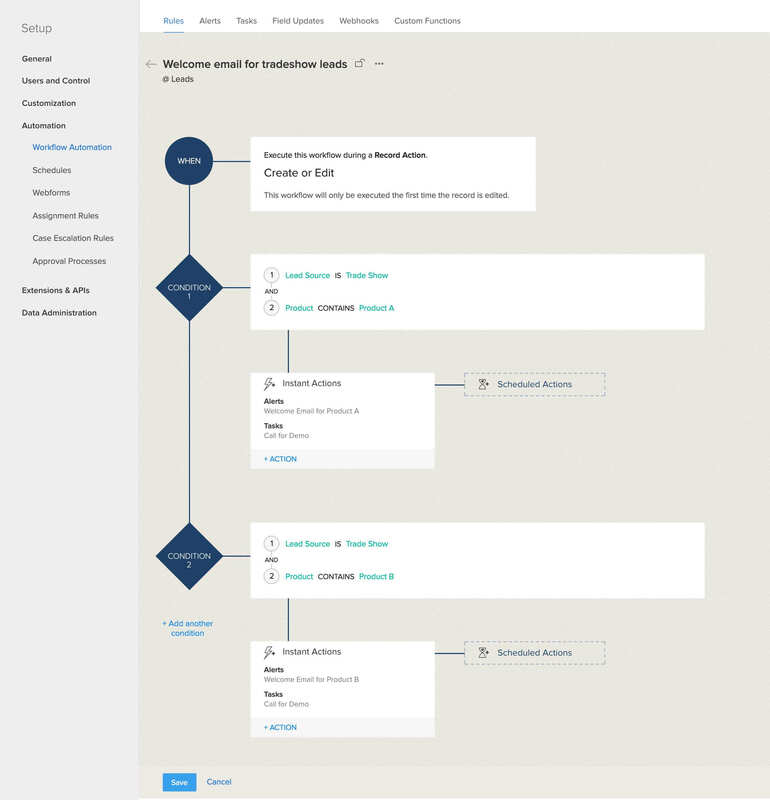 Zia helps you analyze your workflows further with her intelligence. She helps you find out if an email template's modification is not performing as well from a rule's modification. Put the right leads in the right hands. Leads come in through many different channels: web forms, trade shows, even from your most recent import. That means you have to get them into the right hands. This is where assignment rules in Zoho CRM come in handy. Assign leads based on a particular condition say, auto-assign all the hot web form leads to your team's best closer, or the cold-call leads to your champion persuader. Or equally distribute leads to your team through the round-robin method. Spare your fingers, and save time with macros. 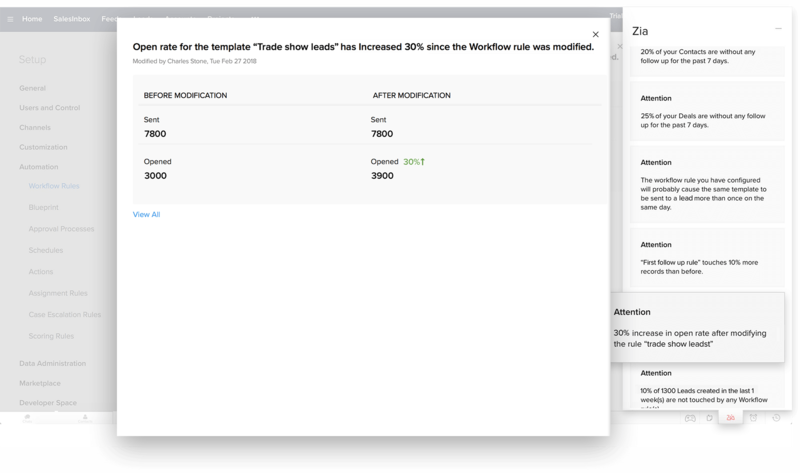 Zoho CRM notices when you're repeating work and suggests macros to get the job done faster. Macros let you trigger a set of actions for routine activities you execute manually. With a single click, use macros to simultaneously send an email, update a record, and create a task. Share them with your team so they can run the same set of actions. Want to text your warehouse every time you close a deal? 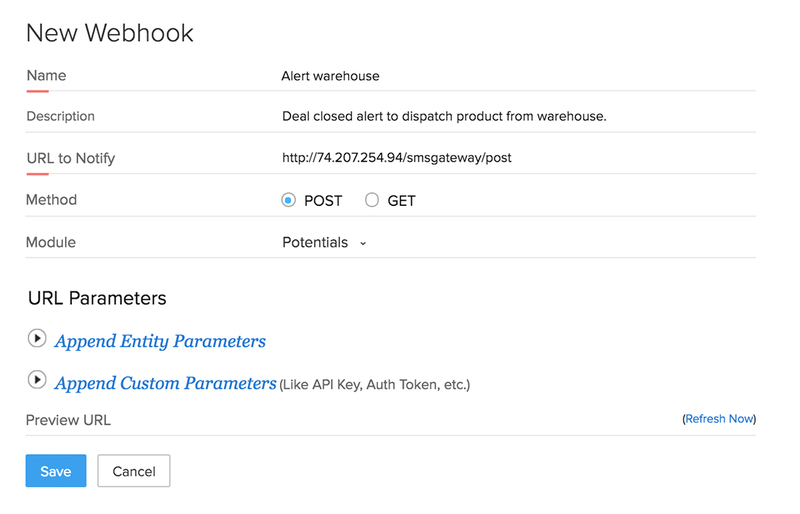 Webhooks let you trigger actions in third-party applications every time an event occurs in CRM. From creating a contact to closing a deal, use webhooks to put your CRM in conversation with hundreds of other apps. Extend your CRM with custom functions. As a salesperson, you need to access different pieces of customer information that are essential to follow up with your leads and close your deals. However, keeping track of all of this data is difficult when you use different applications. Zoho CRM’s custom functions can help you solve this problem. Build custom functions so you can view information from third-party applications that you use on a daily basis right inside your CRM. You can also auto-fill state and city based on zip codes, or calculate cumulative revenue from a customer based on all closed deals.